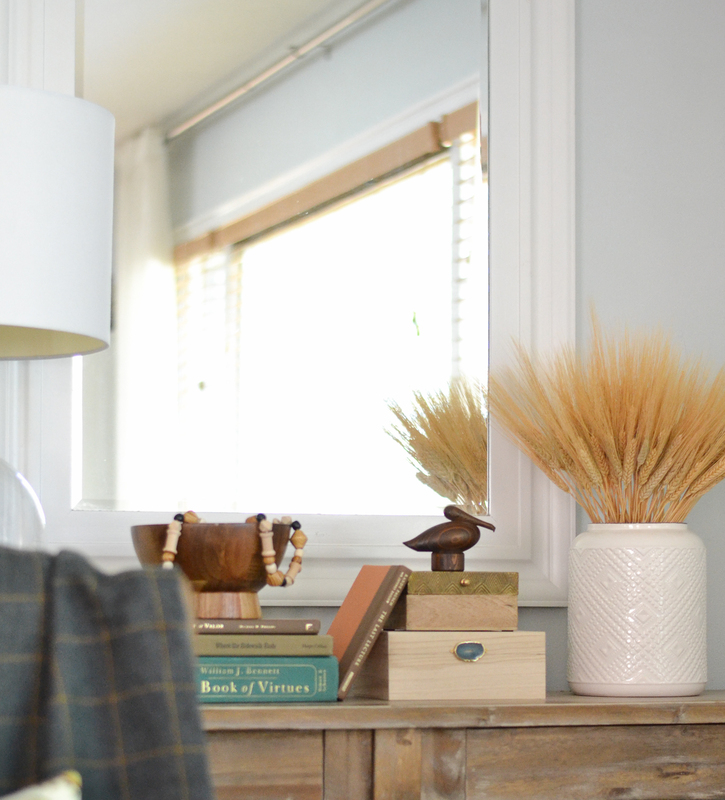 It is natural to want to warm up and cozy up your living space as we head into fall. 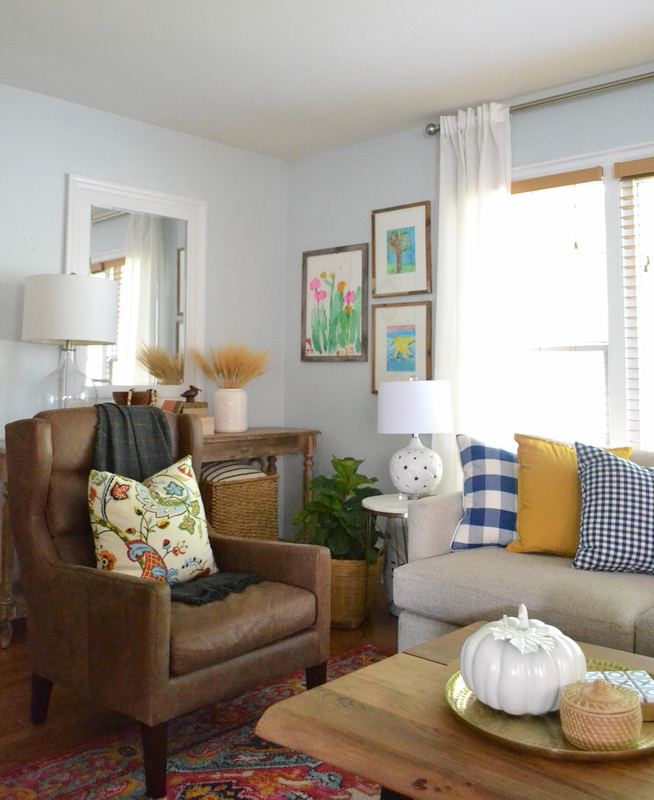 There are five living room decorating ideas for fall that you can implement quickly and with a small budget. 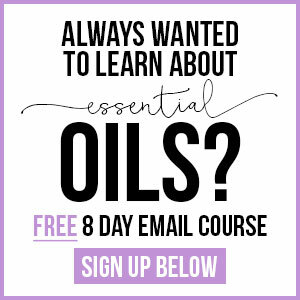 Most of us have limited time, limited funds and limited storage space. This makes living room decorating ideas that are simple a must. 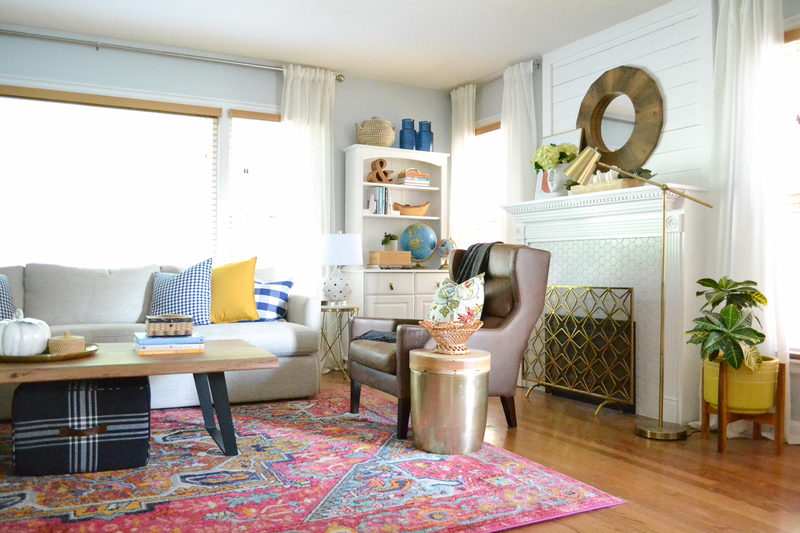 I updated my living room for under $40 by making a few swaps and utilizing some great finds. Fall decor is a combination of adding coziness and warmth. Deep, warm colors, jewel tones and texture create a chic fall living room. 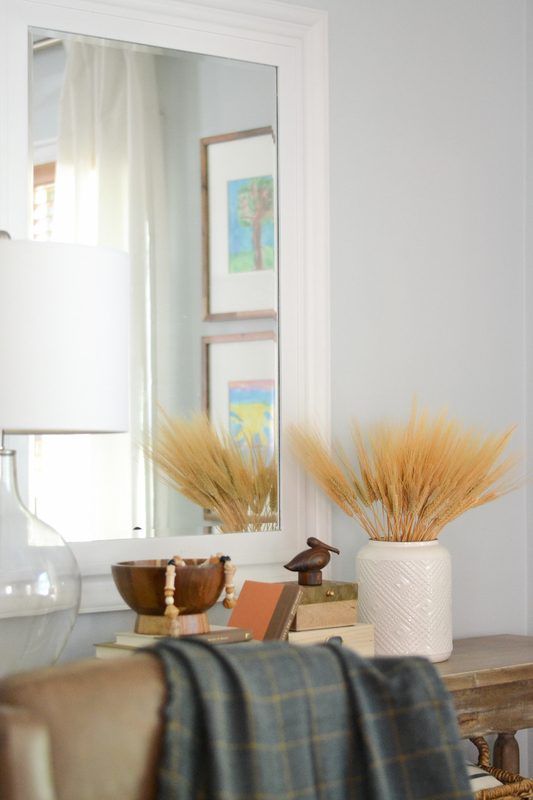 Simple ways to transition your home from summer to fall is by making a few smart, but simple swaps. Throw pillow covers are easy to store and take up very little room and they are affordable. When looking for living room decorating ideas, throw pillows are a great place to start. You don’t even have to replace every pillow. Bring in a solid jewel tone that pops. Add an organic print with warm colors. My summer living room decor included a floral watercolor pillow and purple embroidered pillow that were swapped out to create this fall look for our living room. Believe it or not, those mustard pillow cases were $3.99 at Ikea and the floral print throw pillows on the leather chairs are from TJ Maxx from years ago. Some of you long-time follows might recognize them. That puts the grand total for throw pillows at $8! 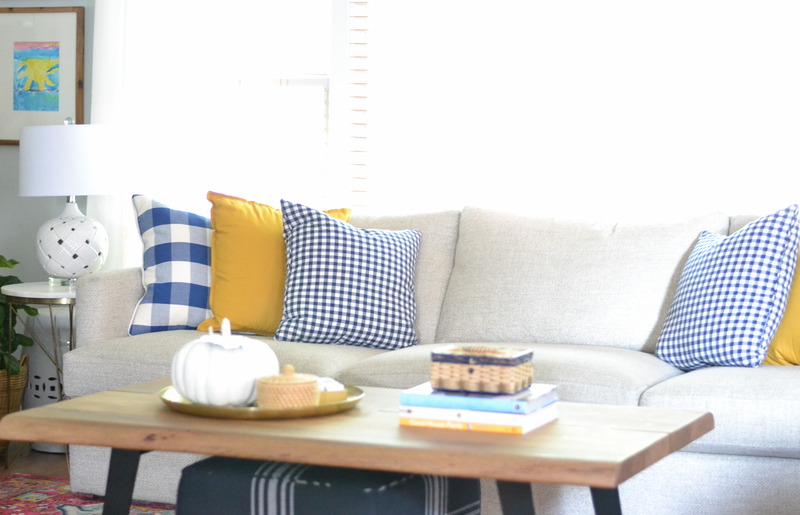 I told you these fall living room decorating ideas were simple and affordable. 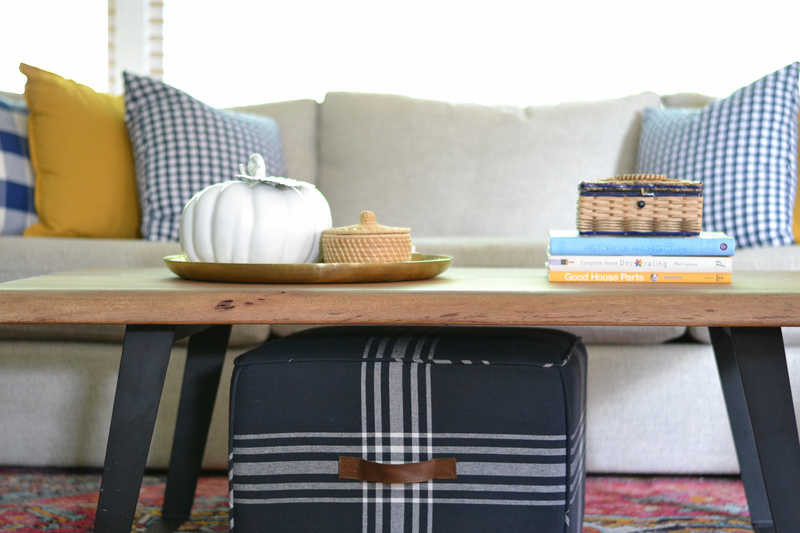 Throw a flannel blanket over a chair and you instantly cross over into fall. This is such a simple fall living room decorating idea. Bring in warmth with cozy throws, add in a pouf, and layer in the texture. Drop a plant in a woven basket and bring in some woven goodness to your living room. Perhaps a woven basket on a stack of books on the coffee table or on an end table. 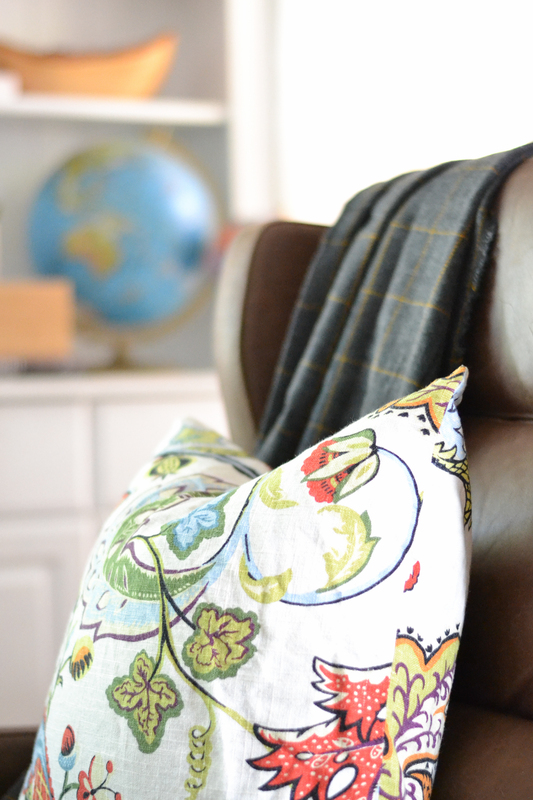 The deep charcoal and mustard blankets on our leather chair were $4.99 at IKEA. That puts our fall living room decorating ideas at $18. And believe it or not, the baskets that were brought into the living room for the plant, on the coffee table and on the end table were all things my in-laws were getting rid of as they prepared for a rummage sale. Don’t overlook rummage sales and thrift stores when searching for fall living room decorating ideas. Warm wood tones make a space feel cozy and cozy is the name of the game when you are looking for fall living room decorating ideas. 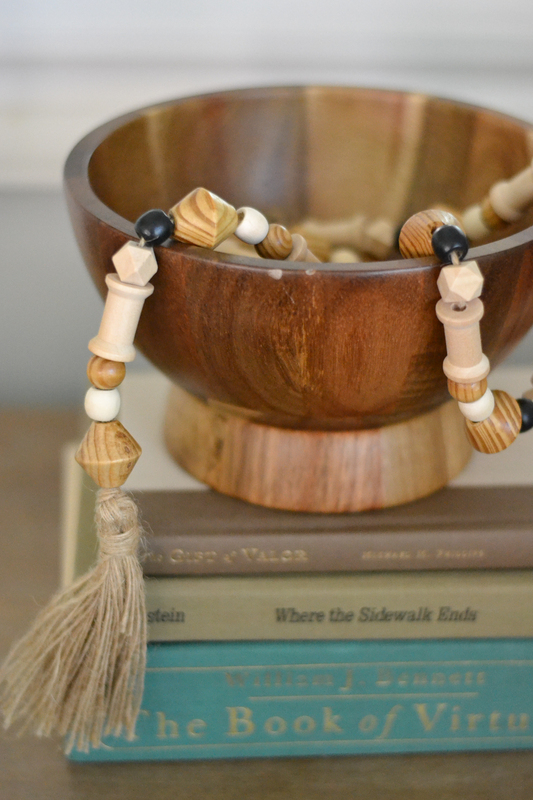 Examples of simple and affordable ways to add warm wood tones is to add a wood bowl, wood beads, wood tray or box or wood figurine. My fall living room additions included a wooden bowl and figurine. The wood bowl was a clearance find at Target (man, do I love me a Target aisle end cap) and it was $5. The wood bird was another rummage find from the in-laws I scored for free. I already had the wood beads, they just found a new home. 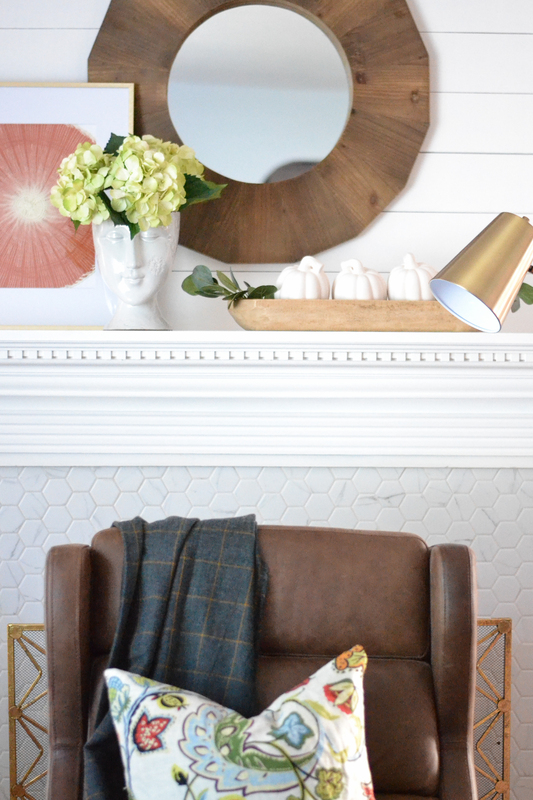 Layering in these warm wood tones brough my fall living room decorating ideas budget to $23. I love a beautiful space, but I take a lot of pride in creating that space on a budget. Having a living room that feels warm, cozy and inviting as the temperatures drop is wonderful thing. Feeling like a craft and hobby shop threw up in your living room, not so much. Welcome fall into your living room with a few well-placed, chic ceramic pumpkins. 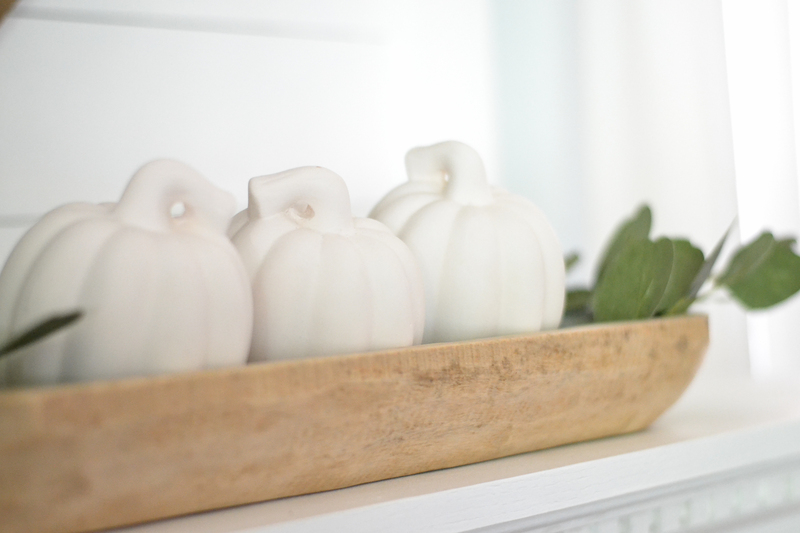 An all-white pumpkin is a perfect fall decorating addition. coffee table vignette with a pumpkin on a tray. 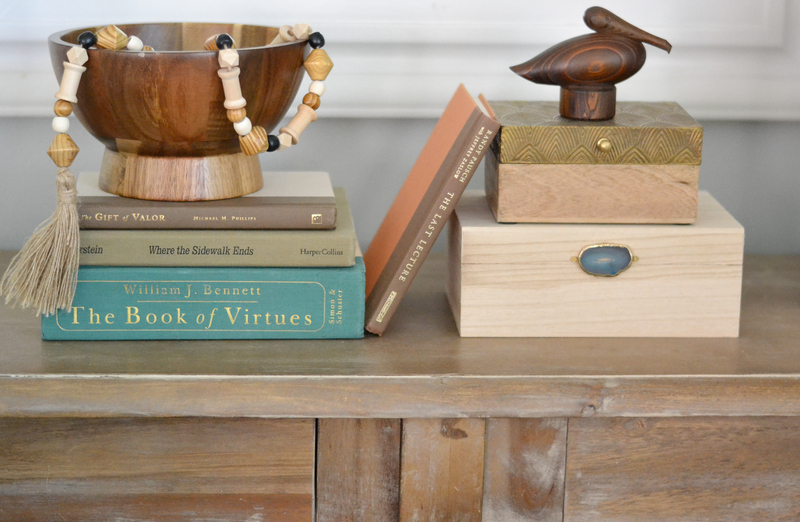 on top of a stack of books on a bookshelf or a console table. 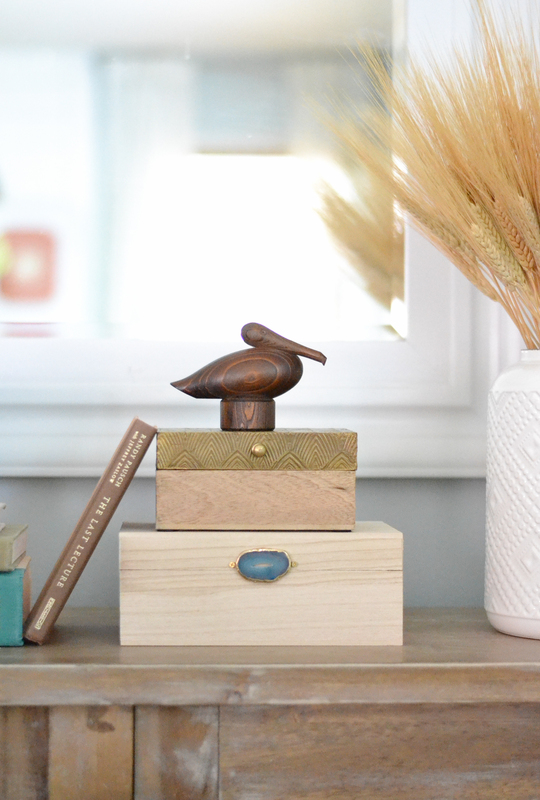 topping off a neat stack of boxes on a console or bookshelf. 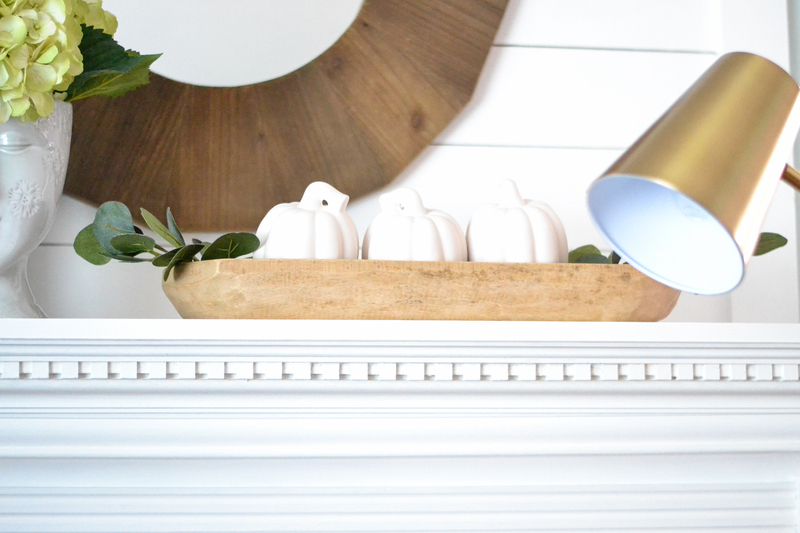 For this fall living room decorating adventure I purchased three small craft pumpkins from Hobby Lobby that were $2.50 each (after the sale) for a total of $7.50 on pumpkins, bringing the fall living room decorating ideas total to $30.50. Whether it is a beautiful branch, leaf clippings or a neutral (like dried rye stalk bundles), fall foliage is one of the easiest ways to transition your living room decor from summer to fall. Layering some greens, like eucalyptus in a dough bowl and topping with ceramic pumpkins is such a chic fall living room decorating idea. Creating a beautiful living room that feels all warm and cozy for fall is something anyone can pull off. 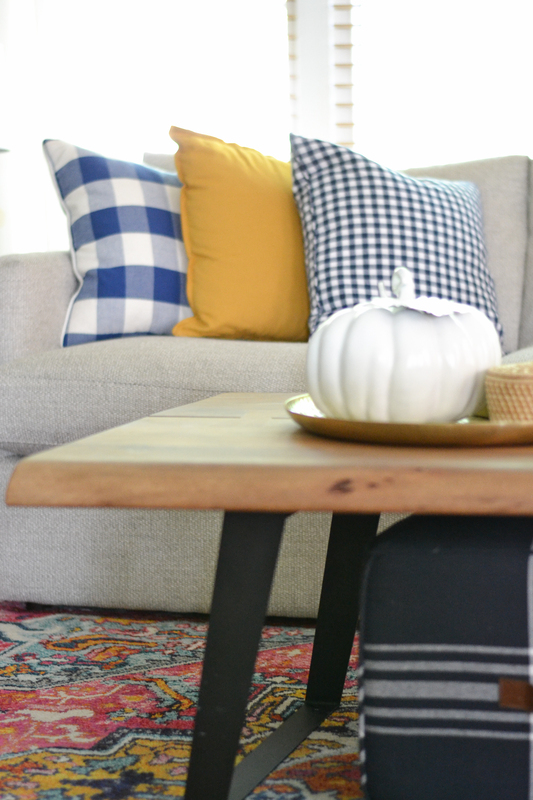 These fall living room decorating ideas are simple and affordable. Work with what you have. 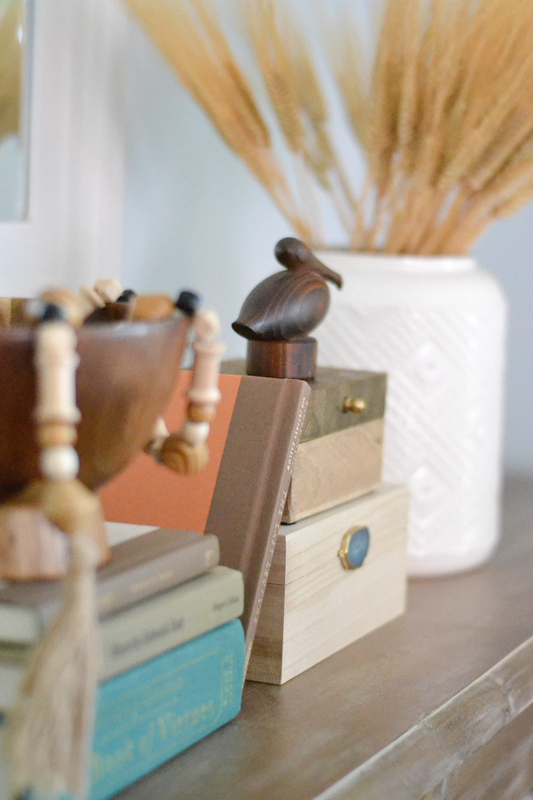 Ask yourself what swaps you can make that will warm up your space. 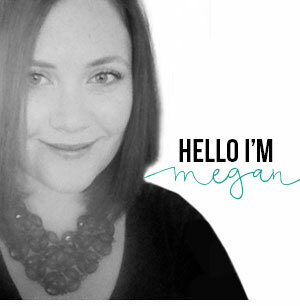 Utilize rummage sales and thrift shops, clearance bins and you can even shop your own home. Remember, simple swaps like dried rye stalks for summer flowers, a fresh jewel toned pillow, a cozy blanket, a well-placed ceramic pumpkin and a few wooden accessories can really create the cozy, chic, fall vibe you are looking for. Do you decorate for fall? 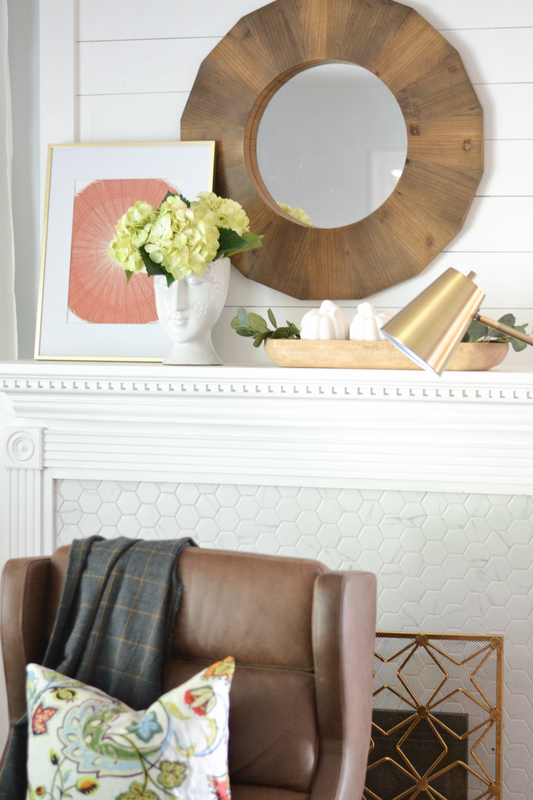 Will you be trying any of these fall living room decorating ideas in your home?